Everyone wants to be successful in life. Magazines, newspapers, the internet, social media, they are full of articles about successful people and the stories of what brought them there. 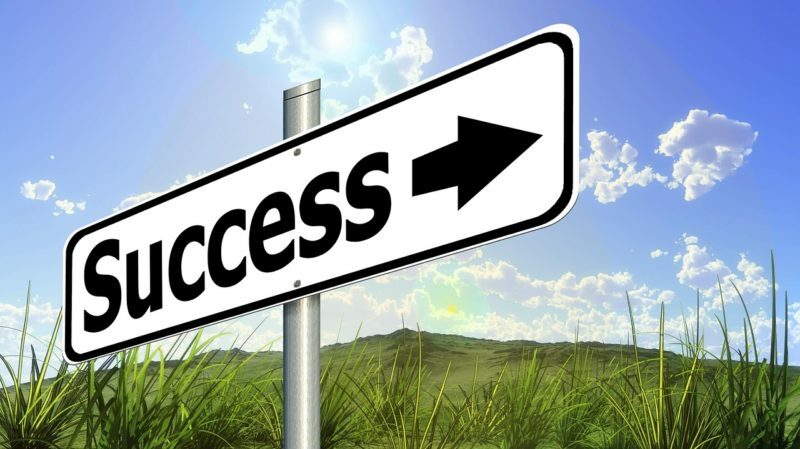 There is an abundant amount of articles on how to become successful, all of them providing the one or two things you need to do to get there. They sound alluring and yes, they help you with success but it’s only one interpretation of success. Most of the articles and books I read about success all talk about one kind of success, namely financial success. How to become the next Steve Jobs or Warren Buffett, how to earn lots of money, how to get your face on the cover of Success or Fortune magazine, how to make the next big thing that will conquer the market. Now what Darren Hardy is saying in this video works. You focus on just a couple of things, get really good at them and yes, there is a chance you become one of those great achievers … if what you choose is appreciated by the market. Maybe becoming the world expert in making clay vases might not bring you the fame and fortune he is portraying in his video. It’s also clear from the examples he shows that the kind of success he talks about is financial success. Although this is broadly viewed as the definition of success by many it’s a one dimensional approach. There are many other types. None of these things will bring in loads of money or get you listed in the Fortune 500. Yet, can you imagine a society without them? Would you like it? So, what is success then? Our broadly accepted one sided view on success is creating a whole range of problems in our society today. Imagine we all reach this much desired state of success. What Darren Hardy mentions in his speech is that these highly successful people, in this hypothetical case all of us, outsource the ‘mundane’ tasks like scheduling their appointments, washing their cars, preparing dinner, … to others so they can concentrate on getting ‘the important work’ done. So, when we all are concentrating on ‘the important stuff’, who are we outsourcing these tasks to then? There’s no one left to do them! The answer is simple, this is an impossibility. And what’s more, these highly successful people only manage to be highly successful because of all the people surrounding them and supporting them in what they are so good at. Not a single one of them would be where they are now without their entourage. Sadly enough we don’t nearly appreciate the work of these supporters as much as the work of the ‘successful’ people. And without ‘non successful’ people no one would manage to achieve the kind of success that our society falsely puts on a pedestal. We are so bombarded with these highly successful people that it becomes easy to slip into thinking that everyone should be like them. That this is what we should all strive for. And a whole industry is set up on exactly that idea. It creates a feeling of inferiority for a lot of people which can lead to unhappiness, depression and ultimately suicide. It’s not a coincidence that suicide rates are higher in countries with a higher standard of living. We are creating huge achievement pressure through our one dimensional definition of success. One of the effects of the kind of financial success our society is putting such a high value on is the loss of perspective in relationship to money. Money is nothing more than a means to an end. It’s something we created to make bartering easier. Money all by itself holds no value, only the promise of value. Yet, for many people money has become the goal instead of the means and that is creating huge problems in our society. While on the pursuit of gathering more money we lose sight of what really matters. Taking care of each other, thinking about what we really need in life, keeping meaningful relationships alive, … How many marriages have been destroyed by the pursuit of money? How many children feel abandoned because they come second place to their parent’s money chasing career? What is the price that is being paid in the name of money? Focus is good and focus is bad, depending on the situation. This one sided focus on success will not serve us in the long run however. Focus serves us very well when we need to get a specific task done. It also creates specialisation if we concentrate on doing a few or even one thing very well. And focus is not everything. When we only have focus we loose sight of the big picture, we get boxed in with our thinking. It makes us lose sight of things as this short video illustrates. Even science realises that reductionism, a result of extreme focus, alone does not hold up in every situation. We also need generalists who can connect the dots. People who, because they don’t focus, keep an eye on the larger picture. It’s through collaboration between specialists, those who specialise in focusing, and generalists, those who spread their attention, that the greatest progress can be made. So, should we abandon the pursuit of financial success? Should we avoid to become famous? Should we get rid of all these idols? In the world we live in today money is perceived as a necessity in order to survive. And the system we constructed enforces this in such a way that it’s perceived as very hard, though it’s not impossible, to survive without. So some financial success makes one’s life easier in current day perspectives. We do need to balance things out though. It’s time we get more appreciation for people that can say no to huge financial success and still see them as successful. It’s time we start appreciating the team as well as the public figure. It’s time we put money back in it’s perspective as a means instead of a goal.